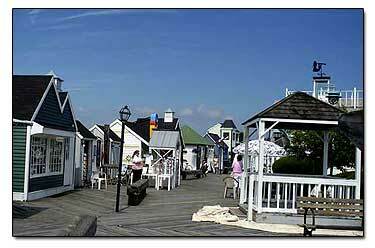 After parking in the Captain's Cove Marina parking lot, the next thing we saw was the cute little dollhouses that line the boardwalk and each one is a separate gift shop of some sort. 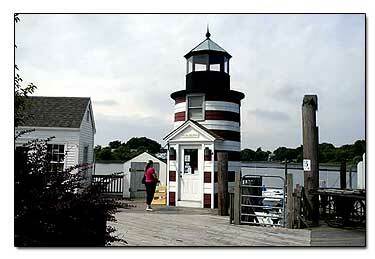 The lighthouse shop is my favorite. It houses local artists paintings that are for sale. Then we began wondering where everyone was at. Where was the crowd? Only one shop was open. The vendor was setting her wares outside on display, and we asked her where everyone was. She replied that the shops usually don't open till 11 AM. So, we were early. She also said that July is their busiest month. As we talked to her, she said that she actually has two shops. One has jewelry and is the only original building left on the property. Her other shop has unique handcrafted items that she bought while traveling across the United States. Everything from bird houses to Indian jewelry. The small dollhouse shops go for about a block and since they weren't open, we peeked in the windows to see all the goodies. A fun place for shopping for Connecticut Souveniers. You can eat in the Captain's Restaurant too. The directions to Captain's Cove Seaport are simple. On I-95 from north or south, Exit 26 to Bostwick Ave. following Captain Cove's well placed signs. Captain's Cove is also close to the Ferry Memorial Seaside Arch and the Bridgeport beach, so you could visit there too. See the Bridgeport lighthouse.